With undaunted energy and perseverance, Mike Lassiter spent six years traveling across the state of North Carolina photographing the historic buildings and community icons that were quickly disappearing from the landscape. The result is this indispensible guide to North Carolina’s cultural heritage – from general stores to barber shops to theatres. Beautifully photographed and accompanied by Lee Grant’s entertaining essays, each chapter offers a wonderful backward glance at the commerce and family enterprise that once existed in every North Carolina town. North Carolina’s history is anchored in its small towns - built by people bonded together by family, church and the land. Our Vanishing Americana takes its place among those photographic essays essential to understanding who we are and how we live... you will not be able to put it down." This wonderful book will be my treasured guide to North Carolina as a living museum of life the way it was when I was growing up. I love to visit the old family run businesses in any town I visit. Now I have hundreds more of the special places to see." ...essential to understanding who we are and how we live." 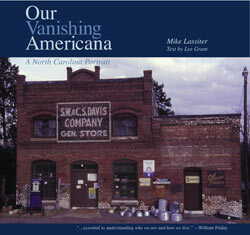 Mike Lassiter is a North Carolina native, raised in Statesville. A graduate of the University of North Carolina at Chapel Hill and Campbell University School of Law, he currently practices law with his father in his hometown. His passion for photography and appreciation for days gone by, combined with his love of driving the state’s back roads, resulted in this book. 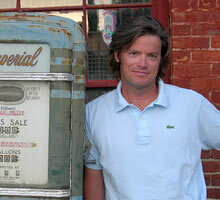 Lassiter lives in Davidson with his three children, Grace, Erin and Michael.